"The Cloisters are the most elegant and perfect of the kind in England. The sides and the roof are profusely embellished, and the windows filled with mullions and tracery. They were begun by Abbot Horton in 1351, and completed by Abbot Froucester in 1390. 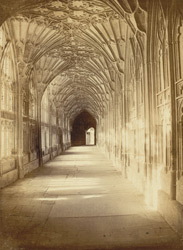 'The idea of the roof is evidently taken from an avenue of trees, whose overhanging heads are curiously imitated in the arching; and if an appropriate colour were applied, and the shades well preserved, the same idea would probably strike more ordinary observers on walking through the Cloisters.' The north side of the south walk contains 30 recesses, in which, according to traditionary accounts, the monks used to sit when employed in copying manuscripts before the art of printing was discovered. In the north walk are the Lavatories projecting into the Cloister garth, which are very perfect. In the east walk are some memorial windows of stained glass; and it is proposed to fill the whole of the Cloisters with glass, forming, when completed, a History of our Lord."